Pit bull are an adorable dog that can be an amazing pet. The only problem is that a number of apartment complexes and cities actually ban pit bulls. American pit bull terriers are a great dog, but they need the right owner. They have developed a bad reputation because criminals and dog fight trainers choose this breed, but the reputation is entirely undeserved. Unfortunately, this situation makes it harder to adopt a pit bull. 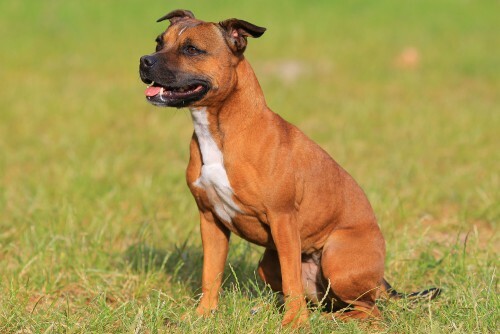 It also makes it hard to adopt terrier breeds like the American Staffordshire and Staffordshire bull terrier because these breeds are identified incorrectly as pit bulls. In reality, the actual American pit bull is exceptionally people friendly. 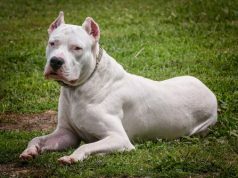 If you are unable to get a pit bull because of your landlord’s or city’s rules, the following dogs that look like pit bulls can give you a similar dog without the same stereotypes. 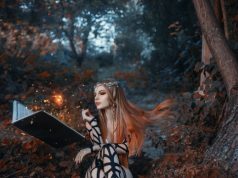 This name might have “old” in the title, but it is actually a fairly new breed. In the 1970s, a breeder wanted to create a dog that was like the bulldog of the 1800s. To do this, they bred together bull mastiffs, English bulldogs, American bulldogs and American pit bull terriers. The resulting do was an agile breed that was less aggressive than the 1800s bulldog. This dog is known for loving to work and being quite strong. He has a tenacious personality and loves staying busy. Because of this, this dog is typically used for pulling competitions and therapy work. It looks like a pit bull, but it has a larger head and a shorter muzzle. This dog is an extremely popular pet in the United States. 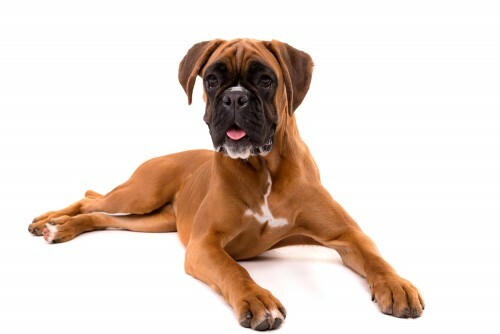 At the upper level, the boxer can weigh up to 80 pounds. She has a lovely fawn-colored coat in many cases, but the coat can also be multiple other colors. This poplar breed is known as a working dog. They were once used as a hunting dog and a guard dog. This cute pup is known for being smart and has a high energy level. When she does not use up this energy, she can get into trouble and do annoying behaviors like barking and chewing. In addition, the boxer can be a fairly stubborn dog. While she is quite good with children, the boxer can also be fairly stubborn. She is a bit smaller than the pit bull and has a different shape. 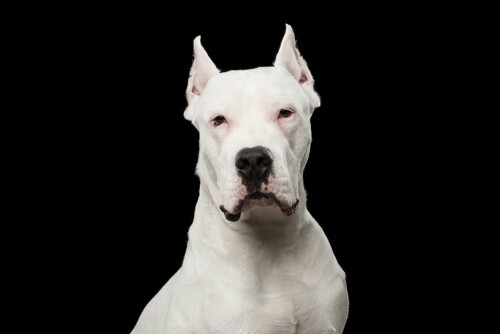 Known for being mostly or all white in color, the American bulldog can easily weigh more than 100 pounds. While it was originally a working dog, this dog can also be a wonderful pet. Since it was bred to work, it needs to get plenty of exercise to behave. This pet can weigh more than 100 pounds and was once a hunting dog. Today, it is a popular pet and is frequently seen in the show ring. It has many pit bull-like traits, but is smaller in size. 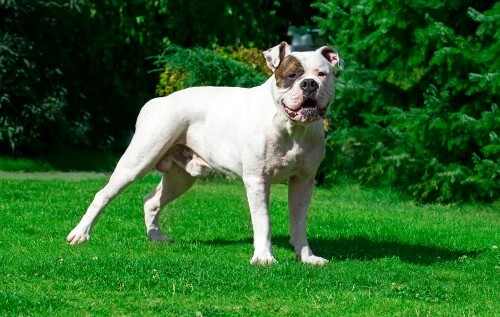 You can get a stockier option by getting the bully type of American bull dog. If you want dogs that look like pit bulls, check out the Staffordshire bull terrier. Nicknamed the “Staffy,” this is probably one of the most pit bull-like dogs. The difference between a Staffy and a pit bull in looks is the blocky head. The Staff has a more squared head and a very distinctive smile. This dog is a great family pet because he absolutely loves his family and is great with children. This is one of the most affectionate dogs and is friendly toward just about everyone. Like the pit bull, this dog is less aggressive toward people than the average dog. Because of how he looks, the Staffy is often mistaken for the pit bull. This is actually a pretty fair misunderstanding because these dogs were once the same breed. 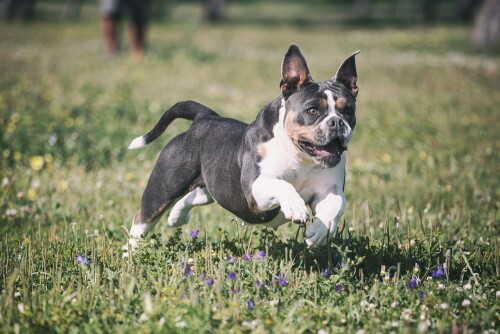 Until not so long ago, the American Staffordshire terrier, the Staffordshire bull terrier and the American pit bull terrier were actually the same dog. They ended up branching out into different lineages, so they are now considered different breeds today. This large dog typically weighs 70 to 100 pounds. 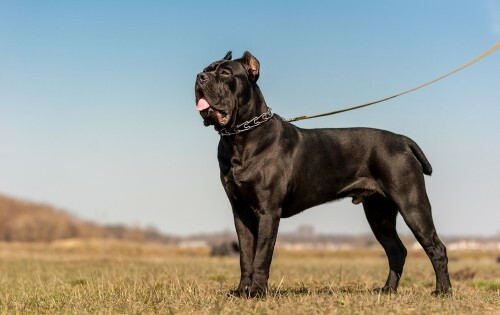 While Cane Corso is my favorite name for it, some people also call it the Italian mastiff. Originally, this protective dog was created to be a guard dog. While this breed is not known for being aggressive toward other dogs, he is extremely protective. He has to be socialized at a very early age because of these protective tendencies. He tends to bond with one family member more than others and needs an experienced handler. While this may be another one of the dogs that look like pit bulls, most people have not actually heard of it. The old breed was popular in the 1800s. It managed to survive in the South over the next century and was relatively unknown. In 1979, this breed came back with a passion. The modern American pit bull was created partially from this dog breed. 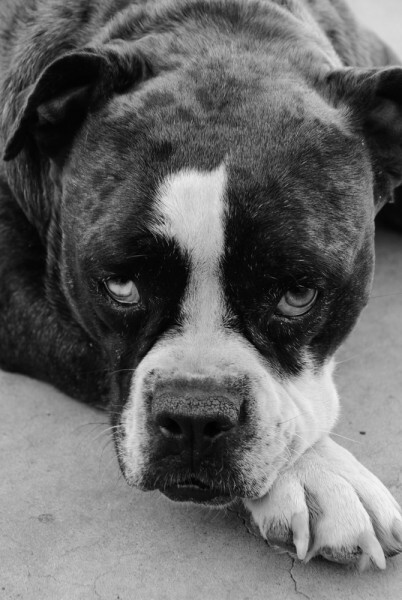 The Alapaha blue blood bulldog is known for being an extremely loving, loyal dog. This spirited, tenacious dog loves being around her family and is a great companion dog. She works well with children and is a great guardian dog. Since she can become overly aggressive if you encourage her to do so, she needs to be socialized and well-trained as a pup to prevent aggression. When properly trained, this dog is an eager, beautiful puppy with plenty of personality. 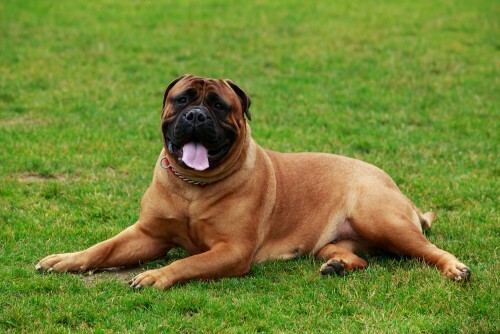 This is a large dog that looks similar to the mastiff. At the upper level, this powerful dog can reach 150 pounds. He was originally red to be a working dog for herding cattle. Since he was designed to be a guard dog and protective dog for the cattle, he can become aggressive if he is not trained properly. 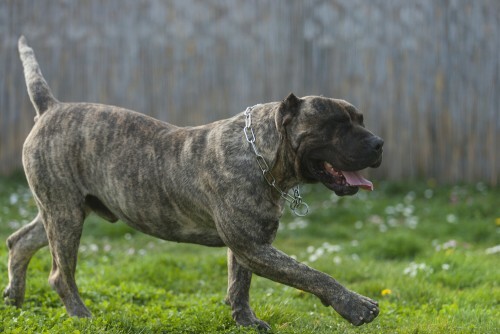 Because of this, the Presa Canario needs an owner who can handle his size and train him out of any aggressive tendencies. While this dog might look pit bull-like, the actual pit bull is more family oriented and will not become aggressive unless it is deliberately trained to do so. Originally bred to kill mountain lions and hunt wild boars, this dog is a fierce hunter. As a guard dog, this brave pup will protect her owner to the death if she has to. She weighs around 100 pounds and is extremely muscular. The dog was recently bred in Argentina and has quickly become popular because of her loyalty. She has excellent stamina, so she is a good choice for active owners. You might recognize this adorable puppy as the spokes-dog in Bud Light ads. While it is often mistaken as an American pit bull, this pit bull-like dog is a terrier at heart. 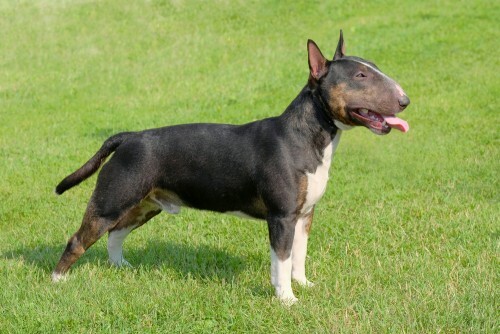 It has a smaller size than other dogs on this list, but is exceptionally muscular and tenacious. This stubborn pup has a strong prey drive though, so be wary of having it with other small pets. He might have a beautiful look and a number of great qualities, but he is not considered the best choice for a novice handler. This large dog was bred to be a watchdog and a guardian dog. You don’t have to train this puppy in protection because he has an instinctive drive to protect his family. 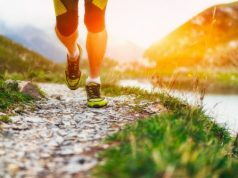 He is extremely strong and athletic, which means that he is a great dog if you like to be active. Training him can be interesting because his intelligence means he dislikes doing the same thing over and over again. He has an independent streak and will instinctively react to any threat.